You need more than just another “overview” of the current compliance landscape. You need a realistic plan to get you through organization, preparation and implementation. 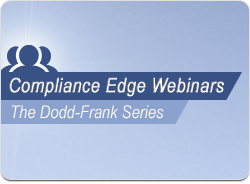 Compliance Edge’s Implementation Roadmap : is a FREE webinar explaining the Dodd-Frank Rules, highlighting a step-by-step plan for implementation and offering organized compliance timelines. The webinar will feature speakers with compliance and legal expertise from different segments of the lending industry, including a major lender and loan origination system provider. We will present a comprehensive 360 degree approach to understanding and implementing the Dodd-Frank Rules. We’re going to set you up with practical tools to help you prepare!